Yes, yes, yes, I am alive and in Japan!!! Sorry if it seems like I’ve been M.I.A. lately! My first few days here were absolutely wonderful, and as much as I wanted to share my thoughts about the beginning of my journey, I really wanted to just soak everything up by myself first. I didn’t have WiFi at first, either, so it was a true and complete immersion for a while. 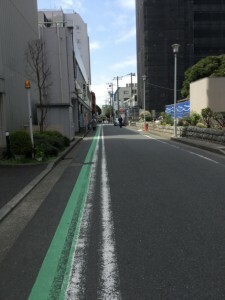 Now that I have been in Japan for a while now and have gotten settled in, I thought it would finally be a good time to write about some first impressions and thoughts I had that you might find interesting or helpful (especially if you have never been to Japan before!). I’ll split it into categories. Not many restaurants give you napkins! You will usually get a damp towel if it’s a nice place, or more commonly, a packaged damp wipe. This is used for you to ‘clean’ your hands before eating. Sometimes restaurants will also have some paper-thin napkins available on the table, but if you are a messy eater, maybe request some extras from the waiter or just be wise with whatever towel you’ve been given. Underneath the towelette is an example of the paper-thin napkins you’re usually given. 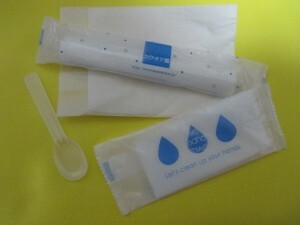 If you go shopping at a conbini, you’re given utensils at checkout as well! Surprisingly, a lot of places offer green tea as the default drink option instead of water. And if they do have water, it’s usually in a really small glass, so you may have to ask for a few refills or just buy some water yourself later. Fast food here is so different than what is considered fast food in America…A lot of it is healthier and has higher quality ingredients. Some people tend to lose weight here because of those reasons. Going off of that, a disadvantage to having really good, healthy food is that it can get kind of pricey. But not to fear! If you plan your meals out right, you can eat a lot of stuff without breaking the bank! 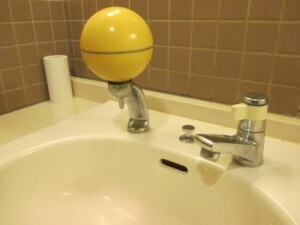 Soap dispensers can sometimes be confusing. A lot of the ones I’ve seen have the pump on the bottom, so the soap goes directly on your hands as you push up. I felt really dumb the first time I encountered one. See that tiny little spout thing under the yellow bubble?! Yeah, that’s where the soap is. BAAAHHHH, OH MY GOODNESS, SO CONFUSING. 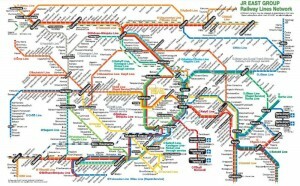 If you ever need a humbling experience, try navigating a train map all by yourself for the first time. -–At least, for me, because I have never encountered public transportation system of this magnitude before. In reality, the system is not meant to be confusing at all and is quite organized, but does take some time to figure out where you’re going (and how) after looking at a million maps and signs multiple times. Once you learn the system, you realize how freaking efficient everything is. My first time traveling by myself by train, I somehow managed to get to my destination early ON ACCIDENT. 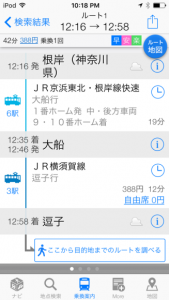 Each train is planned out down to the minute, so you can know exactly when you’ll arrive. I must have taken an earlier departing train when I made a line transfer, because I arrived almost 10 minutes early!! This picture of Shibuya may not be the best example because there are some signs in English text, but it is still cool to see so much Japanese at once! Sidewalks on the road are not really on the “side;” they are just wee little margins of the actual road. They’re SO NARROW! Yep, past the green line is the road. This margin is actually one of the wider ones I’ve seen! I kept getting yanked by the people I was walking with over to the side of the road because I kept going over the line. Many appliances, doors, switches, and other small things you wouldn’t normally pay attention to are just slightly different enough that they can throw you off. Other than the obvious fact that instructions are in Japanese, some knobs and latches have to be turned the opposite way or sideways. 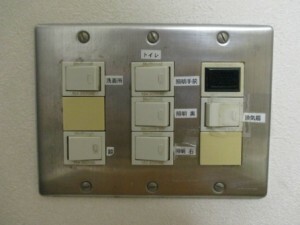 Here’s an example of some typical light switches. Everything is quiet and clean. Even dirty places aren’t that dirty compared to America. The dogs here are TINY. Oh my goodness. And a lot of them wear sweaters and/or have their own strollers that they can ride in. Dog lovers, does this make you excited or freaked out? I’m currently alternating between the two myself. TIME FOR THE “YES/NO” Q&A CORNER! FOR THINGS YOU MAY BE WONDERING ABOUT! …There are a lot of people who speak English and some menus/signs are written in English, but if you completely depend on that, you will get very stuck. Even though most Japanese people’s second language is English, not a lot of people are actually fluent. Usually you will get a very thick-accented, broken English, so do your best to try and learn Japanese so that you can at least meet people halfway. …There are squat toilets. And yes, they are weird to use, but for all you girls out there, they make it easier for you if you’re wearing a skirt that day! 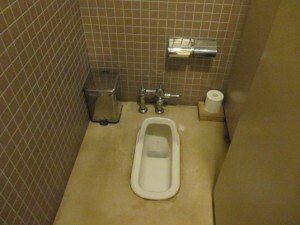 But there are usually also Western toilet alternatives so that you can avoid using them if you want to. 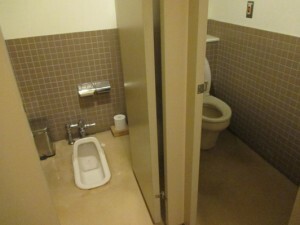 …The high-tech toilets are as wonderful as they say! 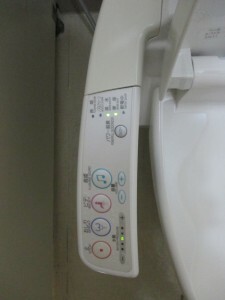 Even though the bidet weirds me out, I tried it anyway, because c’mon, I’m in Japan after all!! And it’s quite nice! Also, the heated seats are amazing, especially when you have to go in the wee hours of the chilly morning. I mean, look at all those buttons! …People do stare at you, because you look different. Usually in their peripherals so that you don’t notice. Unless they’re kids. You’ll get used to it. …The trains are as crowded as people say. Ho boy. It can get pretty hot and stuffy in there. Ugh. But it’s only bad during rush hours! …Being a vegetarian in a country full of seafood is really not as bad as everyone makes it out to be. It’s not like the only thing people eat here is sushi!! 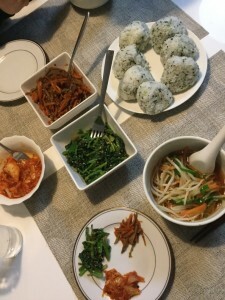 Japanese salad, pickled veggies, ramen, kimchi, and onigiri for lunch! Nutritious and delicious, am I right? The only sad things for me are that I haven’t seen a lot of fake meat products here (bean patties, imitation crab, veggie burgers, etc.) so far, and also that Japanese people have no idea what food vegetarians do/don’t eat, so you have to be patient when explaining to someone. …conbinis are not cheap. Just because they’re convenient doesn’t mean the prices are! I learned that the hard way after getting some of the same products at a grocery store later for a much lower price. …I haven’t gotten truly lost yet, surprisingly! Like, I said. GOOGLE MAPS. It is wonderful. But if your phone dies or something, it is relatively easy to just walk until you find a train station, and then you will be in the clear again. And most people are willing to give you directions as well! 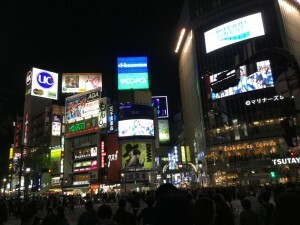 And this concludes my First Impressions post of Japan! If you have a question that hasn’t already been answered or want to see more pictures of something I’ve mentioned, feel free to leave a comment!